There was one of those Aura photo booths set up at this fair I went to. Just for fun I decided I would go ahead and get mine done. When my photo was developed the guy running the booth gleefully exclaimed, "You have the Aura of a child! I've never seen this before in a full grown adult!" Wondering if I had just been insulted, I asked him to explain further. "Oh no, it is not a bad thing. Children are more energetic and their minds are open, and they have higher ESP. When we grow up we get tired, and busy and stressed and we close up. But not you! You are full of crazy energy and your mind is wide open. If you focused your energy you could blow the doors right off of this place!" He was all lit up and excited when he was explaining this, it was sweet, but I figured he said that to all of the cute girls. "It must be all of the coffee I drink." I teased. "No, this is a very good Aura, you are a special girl!" He insisted, "See that white light above your head? Those are the spirits that are always with you. Not everyone has those." That part didn't surprise me. So many people I have loved have died. If there are spirits that follow us around, I would be one to have an army. He went on to show me other people's photos, and he was right, all of the adults had one solid color, the only people with layers like mine and that white and purple outer layer were the kids! Well, we all like to feel special, and I am not one to refuse a compliment, so there you have it. You heard it here first. Even though my birthday is a week away and I am turning 147 years old, my Aura is not a day over 7! Oh, and I am never alone. I hope at the very least they don't peek when I am in the shower! Red/Hot Pink: desire, vitality, power, the urge to win, to have success, intensity of experience, action, doing, love of sports, struggle, competition, force of will, leadership, strength, courage, passion, eroticism, earthiness, practicality, desire for possessions, sense of adventure, the survival instinct. A majority of young children and teenagers especially boys, have bright red auras. Green: perseverance, tenacity, firmness, patience, sense of responsibility and service, self assertiveness, high ideals and aspirations, dedication, puts high value on work and career. Ambitious desire for respectability and personal attainment, deeply focused and adaptable. Green is also the color of growth and of dedicated parents, social workers, counselors, psychologists, and other persons focusing on creating positive change in the world. Violet or Purple: magical, original, tends to be unconventional, often has psychic abilities, unusual charisma and charm, the uncommon ability to make their dreams come true, or manifest their desires in the material world, wish to charm and delight others and can easily connect with higher planes of consciousness. Playful, nonjudgmental, tolerant of others' eccentricities. Sensitive and compassionate. People who have purple auras appreciate tenderness and kindness in others. Not especially practical, they tend to prefer to live in a dream world of their own creation. You'll find many "violet or purple" entertainers, movie stars, free thinkers, visionaries, revolutionaries, and otherwise singular and magnetic individuals. Dark violet could indicate a need to take charge of their life, or perhaps, that the person needs time to spiritually ground himself or herself. White: spiritually motivated, the ability to be open and receptive to the divine, or spiritual world. Can merge with ALL THAT IS. Probably unconcerned with worldly matters or ambition. Inner illumination, cosmic wisdom characterise the white energy. Young children, energy workers, and people who meditate intensely often will show bright white in their auras. Generally, white does not often appear in the auras of adults. 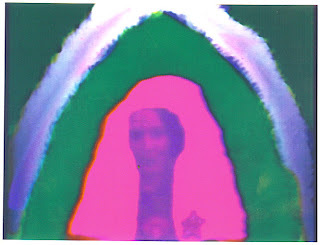 I had an aura picture taken several years ago. Mine showed that I was an artist,& tired (was on night shift at the time) & I had 4 distinct white beings hovering above me.It was very interesting. I'm not surprised about yours, it really is who you are.